Time for more Elf on the Shelf Ideas for you to use at your house. 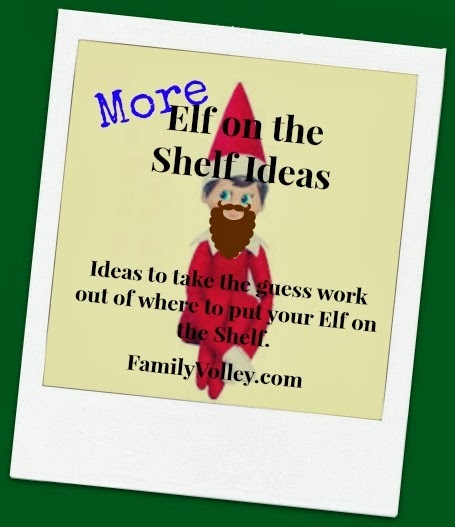 Remember, if you are following along, Family Volley is taking the guess work out of where to put your elf this holiday season. Here are 7 more ideas for the upcoming week. 1. Set your elf up to have a snow ball fight with another toy. Use blocks or lego's and make two little walls and have the elf and the other toy stand behind their respected walls. Then, scatter some mini marshmallows around the scene. 2. Photo Booth: make a few tiny photo booth props. A mustache on a stick would do the trick. Then have your elf posing with the prop. You could make a few extras and have your elf posing with a few stuffed animal or Barbie friends. 3. Set your elf up holding a small pair of scissors, cutting a snow flake out of paper. Be sure you put another finished snowflake next to him too. 5. Set your elf up working on the computer. 6. Set your elf up doing a puzzle. 7. Using big Marshmallows, have your elf building a snow man. They make jumbo size marshmallows now also. Those would work even better. I would love to hear your favorite Elf on the Shelf ideas. Share it with us in the comments, or email me, and I will include it next week with a shout out to you. This was our first year doing an elf-on-the-shelf-type thing. I want to try some of your ideas next year - especially making a snowman with marshmallows! Thanks for sharing! Cute ideas! I don't have any kids, but I love the Elf on the Shelf. I might have to get one for myself next year ... ha ha:) Stopping by from your SITS Girls Tribe. I was complete encouraged to accretion this site. I basic to accede you for this adapted read. I in achievement savored every little bit of it and I acquire bookmarked you to assay out new accepting you post. These are great ideas for where to put your elf dolls. The snow ball fight sounds great!